Products: Distress Inks: Twisted Citron, Mowed Lawn, Pine Needles, Festive Berries (Tim Holz). Holly stencil (Penny Black). Mini red rhinestones. Handy Christmas Greetings stamp set (Amy R). Dyed Crinkle Ribbon. 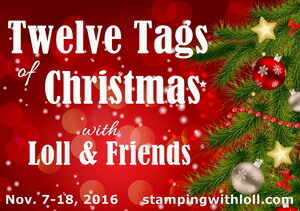 Please check out Julia's blog to see a full description of how the above tag was made. 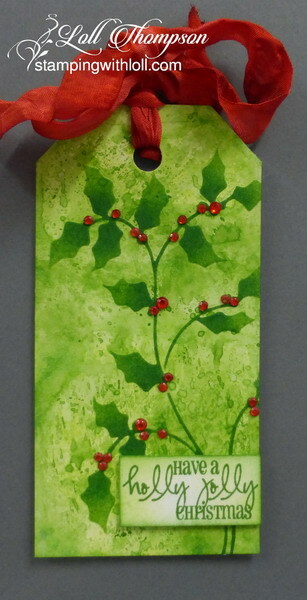 Loll, Love your gorgeous splashed background for your beautiful stenciled holly leaves and pretty red rhinestones. Your died ribbon adds a wonderful Splash of Red! 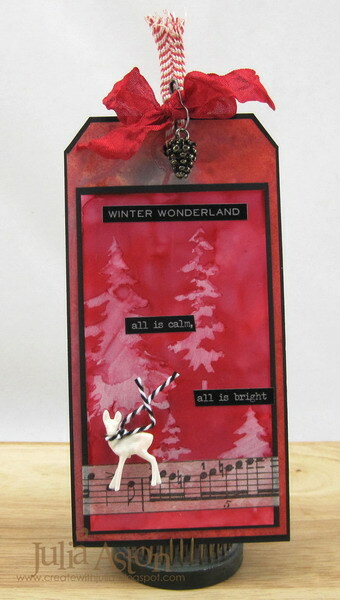 Julia's Guest Designer tag is Gorgeous as well with her rich red colors and fun embellishments. I am off to check out her blog. I love the use of the stencil against your water splashed background! The tiny red rhinestones accent it so beautifully! The bright red seam binding finishes this off so perfectly! What a fabulous tag by Julia too! That background is GORGEOUS and the holly blends in so perfectly! Love those tiny berries and the way you've done the sentiment so it blends but yet is unique! Love that curly tie too! Beautiful Loll love that stencil. I need some holly it really looks so pretty against the watercolour background. Love the beautiful background and the holly. Perfect red accents on the green with the gemstones and the ribbon. I love the vivid shades of green, all so smoothly blended. The rhinestones and ribbon are a beautiful contrast. The red tones on Julia's tag are so dramatic - the Washi is a nice touch. Such a lovely tag with the stenciling over that background and a pop of red! I'm a sucker for vibrant green colours like that.